After wearing polish for more than a week to review the new Revlon Parfumerie Scented Nail Enamels I was keen to get my beloved Shellac back on. 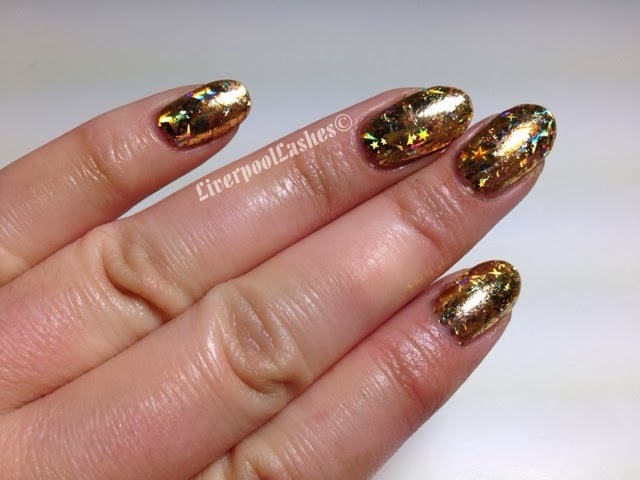 I wanted to go for something a little showstopping as it's coming up to the Christmas party season and it gets people to start thinking about what they want on their own nails. I finally settled on Shellac with foils which I feel are the ultimate eye-catcher and as soon as I arrived at college at least three girls commented on it. This is Shellac's Sugared Spice with Gold Starburst Foil on top which I generally buy from naildelights.com. I do have a video below on this method using Shellac although you can do this with any gel polish.